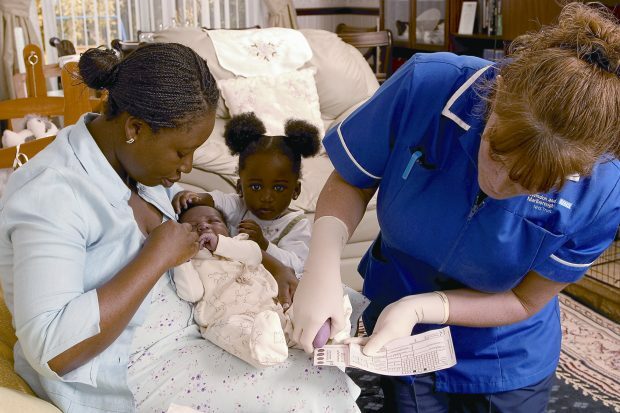 This year marks the 10th anniversary of the full roll-out of newborn screening for sickle cell disease (SCD) in England. We’ve screened nearly 7 million newborn babies for SCD between 2006 and 2016. Babies are screened for SCD as part of the newborn blood spot screening test, also known as the heel-prick test. Of the 7 million screened, just over 3,200 (approximately 1 in 2,000) have screened positive. Despite detection of thalassaemia not being part of the programme, we do expect beta thalassaemia major to be detected and reported. In the past 10 years, nearly 250 cases of beta thalassaemia major have been identified (approximately 1 in 27,500). SCD is the name for a group of related conditions that affect the quality of haemoglobin and the capacity to carry oxygen around the body. The most serious form of the disease is sickle cell anaemia. Screening for sickle cell disease in newborn babies identifies infants affected by the condition, with the aim of minimising childhood morbidity. Children with the condition are at risk of severe illness or even death from infections. Early identification of the condition allows treatment to begin promptly. The introduction of the NHS Sickle Cell and Thalassaemia (SCT) Screening Programme in England has also been the major driving force for improvements both in awareness and in the quality of care for children and families with sickle cell and other major haemoglobinopathies. Research in 2004 showed awareness of SCD and thalassaemia was low. The national screening programme established relationships with patient organisations including the Sickle Cell Society and the UK Thalassaemia Society. These relationships allowed the programme to understand the user perspective and raise awareness through successful outreach work in communities most affected by the conditions. Iyamide Thomas, of the Sickle Cell Society, said: “By investing in a public outreach programme for sickle cell and thalassaemia, the NHS Sickle Cell and Thalassaemia Programme showed its commitment to the communities most affected by the 2 debilitating conditions and to the voluntary sector organisations that represented them. “The programme commissioned the Sickle Cell Society to deliver an innovative family legacy DVD outreach project. Through this, thousands of people, particularly within the high risk African and Caribbean population, became more informed about sickle cell disease, the myths surrounding it and the value of screening – thus enabling many to make informed reproductive choices. The NHS SCT Screening Programme has also worked with patient organisations in developing standards for clinical care for children and adults. Now, the standard for screen positive babies being referred to a designated healthcare professional by 8 weeks of age is being met in 99% of cases and 85% of screen positive babies are seen in specialist treatment centres by 3 months. Another development – and an important component of the specialist commissioning of haemoglobinopathy services – has been the introduction of geographical networks and specialist treatment centres to ensure all individuals affected by sickle cell or thalassemia disorders have access to the best available care regardless of where they live. An evaluation of all cases of SCD notified to the newborn outcomes project between September 2010 and August 2014 demonstrated that screening results were consistent with diagnostic results. To date there have been no cases of false negative results (babies with negative screening results who subsequently turn out to have sickle cell disease).